Posted by rawkfistmusic in 2009, Hurt. 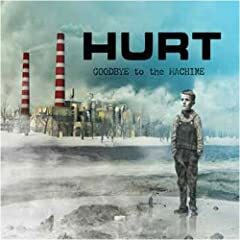 It took me an unusually long time to crank out the review of Hurt’s new album Goodbye To The Machine. The unique entity known as Hurt has put out three full albums prior to this, each one with enough diversity and difference from other modern rock to stand it’s ground as a completely unique offering. Hurt’s latest is no different in this sense. The music is deep and each song is it’s own super-special rare gem of a track. However, it’s because of this I had to make sure every track felt right, that I got the message of every song and truly felt each one before delving into this review. Now that I’ve gotten through this CD a good 20 times, it’s time to drop a bomb I was already sure of after one playthrough. This album is awesome. “If I don’t get out of here, I’m gonna kill someone,” are the empowered opening words of “Got Jealous,” a track which describes almost exactly what it sounds like it would. Frontman J. Loren sings with the intense passion fans of Hurt will be familiar with, and alongside him in the powerful chorus is a nice harmonizing of the phrase “I think I got jealous.” The opening song may be the catchiest and most relatable on the disc, as many will know of the overwhelming theme of jealousy and wanting to lay your hands on someone over it. Don’t get too worked up in the theme of one song however, as “Pandora” will be sure to trip you up with it’s distorted faraway vocals and fantastic riffs from guitar and bass alike. Bassist Rek Mohr begins proving his worth at this point in the record. Allow me to go on though, we’re nowhere near the end of this wonderland. If you though “Got Jealous” was intense, you’re not even close to ready for “Wars,” the first single from the disc. It’s a classic crescendo song, starting with nothing more than Loren and a piano. The song slowly jumps to it’s peak with the introduction of Paul Spatola’s guitar work, and an ever present, simple drum beat from Louie Sciancalepore. Every instrument intensifies as the song reaches it’s thrilling conclusion, Loren screaming into your ears “There was never a day that went by that’s a good day to die, won’t you please close your eyes.” Shivers? You bet. Feel free to hold on to those too, as the next track “World Ain’t Right” is a slow jam featuring Seether’s Shaun Morgan on guest vocals. The lyrics are mezmerizing and will lure you right into this haunting song. Three paragraphs and only four songs? Clearly I’m rambling, let’s condense. “Sweet Delilah” is another slower song that compliments “World Ain’t Right” very well, then slips into “1331” with a slightly faster tone, then furthermore into “Role Martyr X”. The latter of the three is perhaps the most fist pumping song on the disc, with it’s intense fretwork and awesome vocal ending. Yes, as the song concludes, Loren chants “I am the most humble, I am the most humble man in the world.” The irony is delicious. “Well” is fantastic with it’s bass-heavy intro and Loren’s low, fast-talking vocals previously seen a lot on past Hurt albums. That is, until he raises it for the chorus, which turns this into a catchy number for sure. There may be a radio hit in “Pills,” which follows soon after, which sounds uplifting enough but lyrically is more depressing than anything. Drug reliance is certainly a fun topic for a rock band to touch on though, and Hurt’s take on the matter is unique for sure. “Dreams Away” and “Fighting Tao” close the album as hard-rockers, with excellent violining on the latter, and “That (Such A Thing)” is a slow track with production in the same vein as a live acoustic performance, serving it’s purpose as a very chill album closer. Stay tuned for a fairly funny bonus track too, the words “We’re all gonna die,” see a lot of use. How do I love Hurt? Let me count the ways. There’s great muscianship, every instrument is absolutely masterful in it’s use. Never are you drowning in a frantic guitar stretch, nor driven mad by a repetitive drum beat. Every song is put together masterfully to emphasize each of Hurt’s great parts. The lyrics are some of the best in rock today, and the song structure is unique, breaking the typical formula of other songs. There’s no flaw in this CD, and I never once for a second thought there was. Everything is put into place as best as can be, and Goodbye To The Machine is twelve tracks that anyone should be able to enjoy. Like this review? Add Rawkfist Music on Twitter for constant updates on new reviews and site updates! I’ve heard some of them (from Emily’s iPod) and they sound very good. 10/10 is pretty high! good for them. great review man, i am even more pumped. A 10/10 means if I loved this band as soon as “Rapture” was so ultra-addicting when their LP ‘Vol. 1’ was released, I know “Wars” would have me pumped, no questions asked. A fair enough review.